7 Kids and Us: Chick-Fil-A is Celebrating 50 Years of the Original Chicken Sandwich! 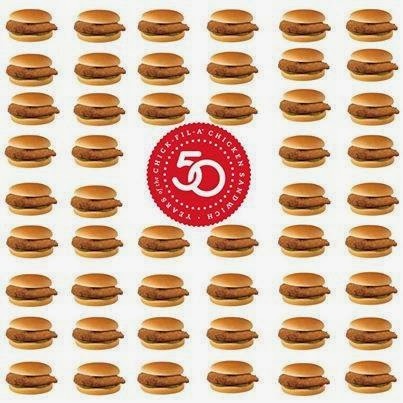 Chick-Fil-A is Celebrating 50 Years of the Original Chicken Sandwich! Chick-Fil-A just happens to be the go-to restaurant for Casey and I, and we are super excited to learn that this year is the 50th anniversary of the Original Chicken Sandwich! Every time we are in Chick-Fil-A, Xander reads me the tray paper that says "we didn't unvent the chicken, just the chicken sandwich" and finds it fascinating that Chick-Fil-A really invented it! They sure do it right too, and we love that we can get extra pickle, or no pickle on our sandwiches. Now that my boys are getting older, they have moved on from the kids meal, and always get an adult meal (sometimes they ever try to take my food too!). 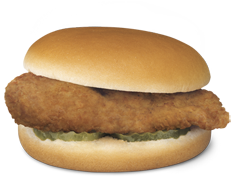 So this year is even more special to us, since our favorite menu item is the Original Chicken Sandwich. Chick-Fil-A has graciously offered the readers of 7 Kids and Us the chance WIN an offer card good for a free 8 count chicken nuggets in February and a free medium lemonade in March. I love their chicken sandwiches. my fave item is the chicken sandwich. I like their chik fill a sauce. Smoky, sweet, and delicious. I love the Chicken Nuggets and their Chicken Biscuits. I like the grilled chicken market salad. I like the original chick-fil-a sandwich. The nuggets are my favorite. They beat the nuggets from any other restaurant! the nuggets are my favorite, but those waffle fries are pretty awesome too. I love the 8 piece chicken nuggets! I like the chicken strips. I like their Waffle Fries! I love the nuggets with their awesome bbq sauce and waffle fries. LOVE Chick Fil A!!!! their chicken sandwich is so yummy! The chicken salad sandwich is my favorite! I Love chick-fil-a chicken strips and waffle fries! I love their chicken sandwich! The spicy chicken sandwich! Yummmmm! I love getting their chicken nuggets, fries (they have the best fries), and lemonade. We love their chicken nuggets. Cookies and cream milkshakes are awesome!! I have never eaten at Chick-Fil-A before but I'm sure the nuggets would be a hit with my family. Based on other comments, I would love to try the waffle fries also. I like their chicken noodle soup. can't go wrong with the classic chicken sandwich! Love the spicy chicken sandwich and waffle fries! Their dream cones are so yummy too! I enjoy the grilled chicken market salad. The spicy chicken sandwich is my favorite. I've tried all the salads and they are really good. I like the regular chicken sandwich with the pickle. I love the chcicken minis. I like the chicken biscuit and lemonade. I love the chicken nuggets!!! I love their chicken nuggets!! I love their Chicken Sandwich and waffle fries. I absolutely love the Chicken minis for breakfast they are so good!!!! I like the original crispy chicken sandwich with the waffle fries on the side. Original chicken sandwich & cole slaw. The Original Chicken Sandwich & cole slaw. What is your favorite menu item at Chick-Fil-A? The waffle fries are my downfall. The number 1, chicken sandwich with the large fries and the sweet tea, little ice and one lemon. i like the waffle fries. i am tony l smoaks on rafflecopter. I like the Chargrilled Chicken Club Sandwich. I love their grilled chicken sandwiches! I like the chickie biscuits! My favorite is the chicken nuggets. My favorite item is their Grilled Chicken Caesar wrap. Their Salads, love the avocado dressing! The Original Chicken Sandwich is my favorite. I love the chicken sandwich! I love their Icedream! Thanks so much for the chances to win something! Disney's Minnie-Rella DVD Giveaway! 4 Winners! Coastal Living Body Care now at Lands End!